Well the summer holidays are well and truly over. Many teachers, particularly those who are relatively new to teaching, will spend this weekend making lists, planning lessons and experiencing that unsettling feeling of nervous excitement. If you have time to read this week's set of maths gems, I hope they provide a little light relief. I devote a lot of time to thinking about how to develop my teaching but spend far less time building on my own mathematical skills and knowledge. Whatever our background and however 'good' we are at maths, there's always more to learn. For example, I’ve never studied any mechanics in my life (I did Pure Maths A level and a statistics degree) but SUVAT is on the new GCSE syllabus so I'd better find out what it is. 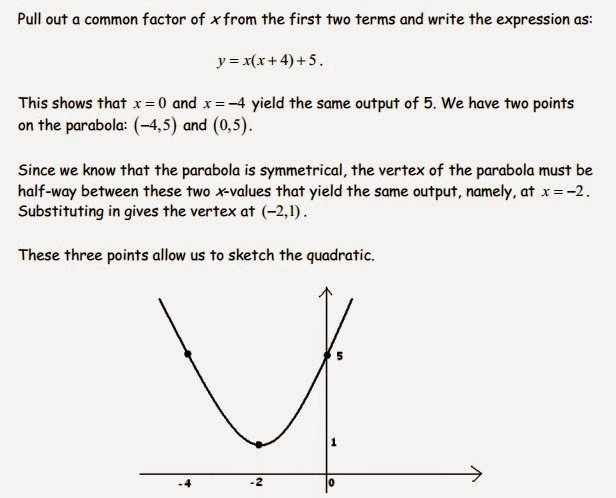 I feel that my knowledge of secondary school core mathematics is pretty sound but this week Ed Southall (@edsouthall) inadvertently pointed me in the direction of James Tanton's website (@jamestanton) and within minutes I was learning new things! Here's a few examples. This seems pretty obvious now. This is my new preferred vertex-finding method! Am I the only person who didn't think of doing it like this? I also discovered that i is not the square root of minus one (watch this video to see why) and that the order of quadrants is based on the rising and setting of the sun! (see this essay for an explanation). At some point I'll read all of James Tanton's enlightening material. I'm also learning a lot from Better Explained's (@betterexplained) excellent monthly newsletters which I highly recommend. Have you seen this proof of the area of the circle? Great stuff by @minutephysics - thanks to @mathslinks for sharing. I tweeted this week that I plan to start allocating each of my pupils a Greek letter to be used during maths lessons (by me and their peers) instead of their name. This will help them learn the Greek alphabet and means I can avoid trying to pronounce difficult names! Of course I was only joking and the responses on Twitter really made me laugh (@edsouthall: "Oi, omicron, look at me, not at rho"). Stuart Price (@sxpmaths) told me that he assigns a Greek letter to each week during the school year. Now that is a much more sensible idea! So I'm going to start writing a Greek letter by the date on the board. My students will write it by the date in their books and say it aloud to practise pronouciation. El Timbre's (@El_Timbre) Greek alphabet poster will adorn the wall. The first week of term is alpha week and we'll take it from there. Lovely idea. The labelling of weeks has a very tenuous link to something else I saw on Twitter this week - in this post written by a student I found out that in Lithuania 1st September is a 'celebration of knowledge day'. Also, in the Lithuanian equivalent of our Year 13, they have a '100 day celebration' in which they have a prom to commemorate that they have only 100 days left of school. The rest of the post is mostly about clothes shopping for Lithuanian teenagers, so not quite so interesting... I'd like to find out more about traditions in education around the world. This brilliant 'Finished? Try one of these...' display got me thinking about the materials I prepare for my early finishers. The creator of this display, Kerry Tait (@misstait_85), wrote a blog post describing the review tasks contained within, which are intended to encourage students to reflect on their learning. This is a really nice idea. Kerry is a science teacher but this would work equally well in maths. At the end of my lessons I tend to go for extension activities rather than reflection tasks. In every lesson I give extension work to the appropriate pupils at the appropriate time. My students know that I'm really impressed if they have a go at the extension material but at the same time I emphasise that maths isn't a race. There's value in occasionally planning a relatively short main exercise and an 'extension' that is accessible to all, not just the brightest or the quickest. Most people enjoy being stretched. I want all of my students to come out of maths lessons feeling like champions. My extension work is usually a challenging question relating to the lesson topic but sometimes I use puzzles instead. For example at the end of a Key Stage 3 lesson on the order of operations I give students the classic four fours puzzle. 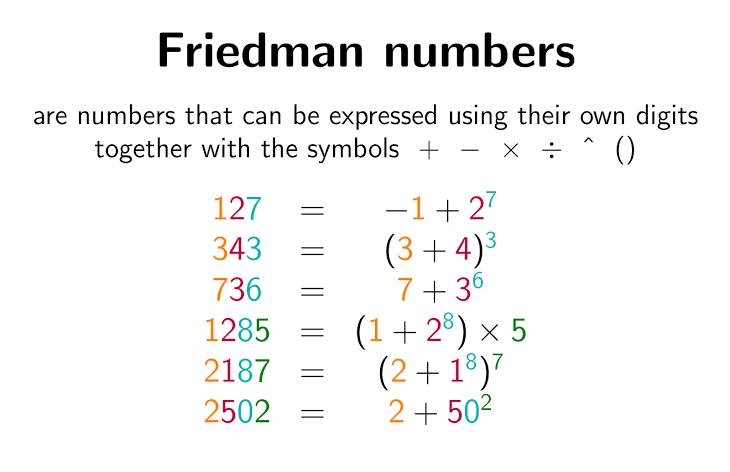 For even an greater challenge there's this sixes puzzle shared by Chris Smith (@aap03102) (I think my sixth formers would enjoy this one), or perhaps even something on Friedman numbers. Here's a few more puzzles and extensions I've come across this week. My school has a lunchtime puzzle club for Year 7s so these will come in handy there too, and I may set up a weekly puzzle board as suggested by Mr Duffy (@MrDuffyMaths). Garrod Musto (@GarrodMusto) shared the news that Mathster now has UKMT challenge questions in quiz format. These hexatrex puzzles look like fun. The Griddle has loads of mathsy variants of sudoku. For the 'Finished? 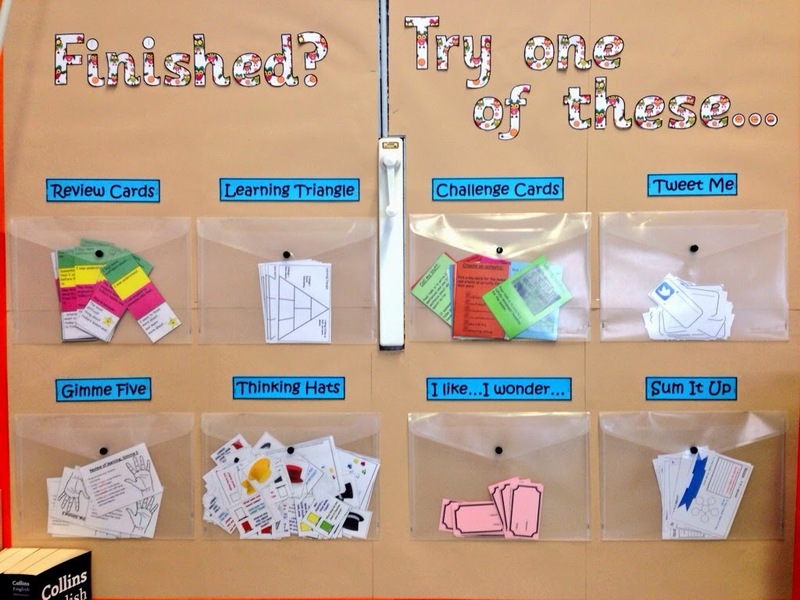 Try one of these...' display, the creator says that she might design a checklist and prize system to encourage students to use the full range of reflective tools. This suggestion reminded me of a couple of other ideas I saw on Twitter this week. In @CorbettMaths' post about how to use his 5-a-day questions, he suggests that students put their completed questions in a ballot box and a fortnightly prize draw takes place. 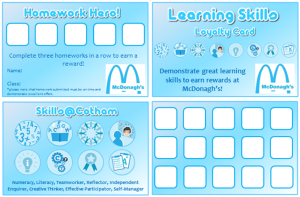 He also shared @MissKMcD's loyalty card ideas which she's explained in this blog post 'Learning with Loyalty Cards'. My blog is about sharing creative ideas and engaging resources. But my lessons aren't all-singing all-dancing. If you were to observe most of my lessons you'd see a pretty standard format of: starter, explanation, discussion, practice, extension. I do create opportunities for students to do investigations and exciting activities but not in every single lesson. As you can tell by the title of my blog, it's really important to me that I pick engaging resources. Sometimes that just means a well designed worksheet. Harry Webb's (@websofsubstance) post about maths lessons and priorities is well worth a read, particularly for NQTs who will soon be drowning in lesson plans. In my NQT year each lesson took me a couple of hours to plan. Four years on, my lessons take around 30 - 45 minutes to plan, which is still totally unsustainable and inefficient but I get a bit quicker every year. Being able to get good resources from my blog should increase my planning speed as I won't have to do so much hunting for resources. Harry's post also gave me a new idea. A box on the board for students to write down the homework questions they found hard - such a simple idea but much better than how I do it at the moment, which normally involves lots of students talking at me at once! I love this 'things to do when you're stuck' poster from The Maths Magpie (@TheMathsMagpie). I discovered a website for maths animations - mathimation.co.uk. New stuff is being added all the time so follow @mathimation for updates. Anna Hester (@TypeAMathLand) shared an infographic syllabus - I borrowed her idea and made a 'brief guide to AS level maths' infographic for my Year 12s. It was fun and now I'm looking for other things to infograph! I really enjoyed JemmaPDuck's (@JemmaPDuck) blog post about her first day back, lots of teaching ideas here. There's far too much form filling in our lives, but here's some forms I read about via Twitter this week that may be useful for behaviour management. These might not appeal to everyone, but are worth a look. Mr Taylor (@taylorda01) has been making some amazing video problems - this one is particularly terrifying so students will love it. 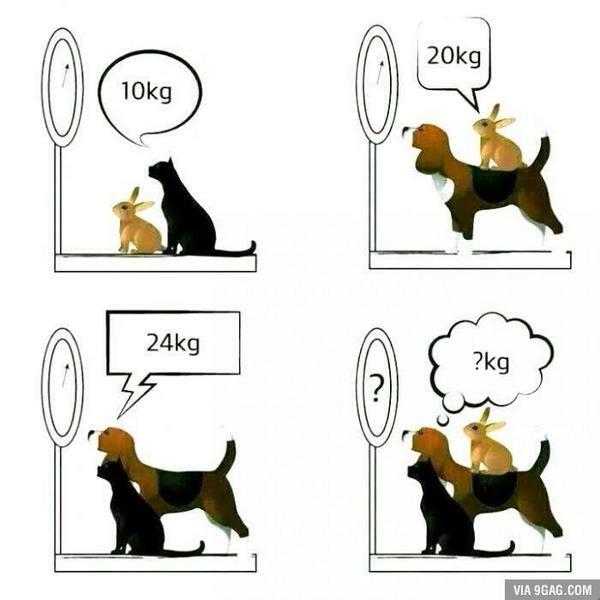 Mr Collins (@mrprcollins) created these incredible comic resources for teaching constructions. The creativity and effort that has gone into these is outstanding. 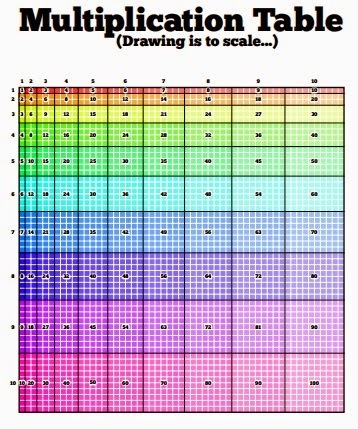 @Daisyplum75 shared this colourful multiplication grid from thegriddle.net. I found out this week that my term 'maths gems' is totally unoriginal - here's a nice 'assortment of mathematical marvels' which are also called maths gems. Speaking of nicely designed websites, do take a look at Mathigon, shared this week by Chris Watts (@watchri01) - stunning, isn't it? So that's it for this week. My topic resource posts will return soon and I'll also work on a new Pret homeworks page for my blog. Pret (practise, recall, extend, think) homeworks were invented by Kathryn Forster (@DIRT_expert) and discussed in my last gems post. 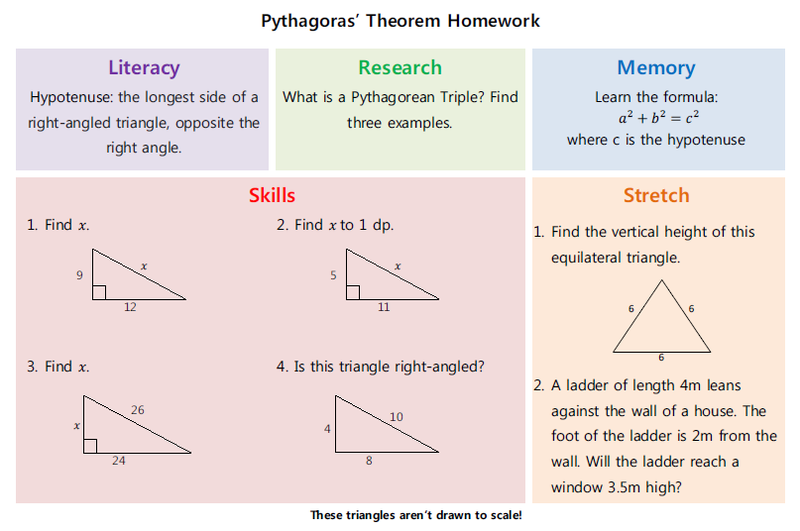 Using her template, I created a Pythagoras homework and intend to make some more. I'd love to share a big range of Pret homeworks so please email me resourceaholic@gmail.com if you make one that you're happy to share. Those of you going back to school next week, good luck! I'd really appreciate it if you'd mention resourceaholic.com to your colleagues. I'll leave you with a nice maths problem for your Key Stage 3 students - this one was shared by F M Jones (@FMJonesMaths).